Metal stud cutting is one of the more typical practices on a construction site. Although common, metal stud cutting and its relation to hot work is not as clearly understood and/or applied. NFPA 51B defines hot work as “work involving burning, welding, or a similar operation that is capable of initiating fire or explosions”. Stud cutting falls under this definition particularly as a result of the sparks generated during the cutting process. This rationale is enforced by Boston Fire Department. Below you will find a brief Q&A to help address some common questions associated with this practice. Question: Is stud cutting considered hot work? Answer: Yes, metal stud cutting meets the definition of hot work as prescribed in NFPA 51B (see above). Question: Does stud cutting require an internal hot work permit per NFPA 51B? Answer: Yes, all hot work requires an internal hot work permit. Question: Does stud cutting require a BFD hot work permit? Answer: No, BFD does not require a hot work permit for metal stud cutting. Question: Is a dedicated fire watch always required for chop saw metal stud cutting even if a City hot work permit is not required? Answer: A fire watch is always required for hot work operations, regardless if the city necessitates a permit from their office, and the chop saw metal stud cutting must be logged as required by NFPA 241. That said, there are some jurisdictions, such as Boston, that recognize that a separate dedicated fire watch is not warranted if specific safeguards are implemented. First, a fire extinguisher must be located at the chop saw table. Second, the chop saw operator must have a BFD certification for Hot Work. Third, the chop saw setup should occur on a noncombustible table, such as Baker staging. 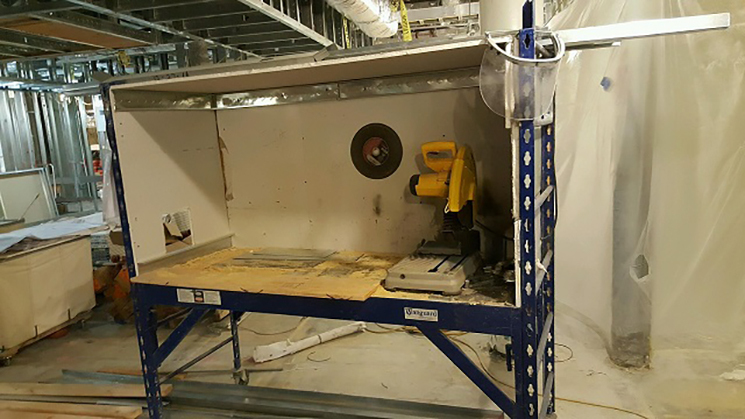 The chop saw work area should be encapsulated fully on three sides with DensGlass or the equivalent. 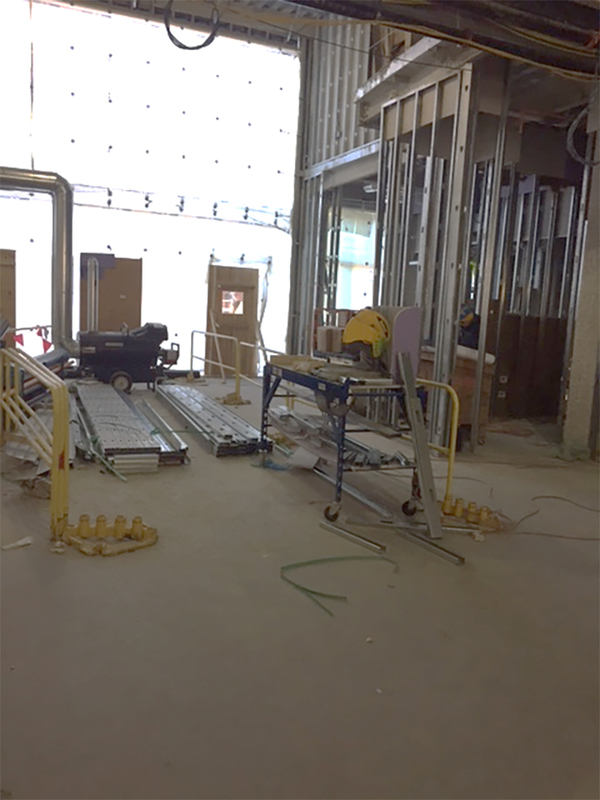 The DensGlass should be tall enough to capture any sparks created by the metal stud cutting operation.The entry side should be encapsulated with DensGlass as well, but an opening is permitted to allow for a worker to comfortably cut the metal studs. The top photo is a representation of this type of chop saw arrangement. The bottom photo represents a metal stud cutting configuration that would require a fire watch, as the DensGlass surrounding the chop saw is not adequate to capture the sparks created by the metal stud cutting.